"There is nothing more useful than salt and sun." Isidor von Sevilla, 600 b.c. Cosmetics. Produced without synthetic preservatives or skin-irritating emulsifiers. Free from gen manipulated raw materials, guaranteed without animal testing. Pure crystal salt is our basis for our cosmetic products. Salt plays a major role in our body and is important for our healthiness. High quality salts support and regulate numerous metabolic functions and have a calming effect on our biggest organ, the skin. The best ingredients are selected carefully and used in our products. Herbal and essential oils combined with seductive assents allow you to feel well an beautiful in your skin, smoothens and moistures. 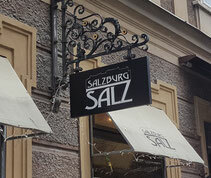 Salzburg Salz cosmetic products enable a healthy and complete care for you, your body and soul. The skin, your biggest and most important organ, it protects, breathes and expresses our personal well-being. You can find a wide variation on different salt products in our shop for every type of skin from relaxing bathing salts, peelings to sole-cream, lotion and oils.